Maximilien-Louis Fiot (1886 - 1953) was born in Le Grand-Pressigny, France January 22nd 1886. He was a pupil of the French sculptor Prosper Lecourtier. Fiot exhibited at the Paris Salon from 1910 until the outbreak of the first world war in 1914. Most of the recorded works by this artist consist mainly of birds though there are some other animals such as dogs, wild cats, and other wild animals. His style is very modern in appearance by comparison to the other artists of the period having an almost art deco feel to them. 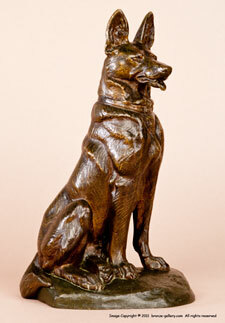 His bronzes speak more of motion then some of the static portraits done by his contemporizes. Most of his works were cast by the Susse Freres foundry but some of his earlier bronzes were cast by the artist at various foundries.